AED classes in Arizona take just a few short hours to complete, but can make all the difference to those in need. After all, the average response time for first responders once 911 is called is 8-12 minutes. For each minute defibrillation is delayed, the chance of survival reduces by approximately 10%. Fortunately, with online, in-person, or blended AED training from the American Red Cross, you can learn the skills that can help save a life. At the Red Cross, you'll find in-person, online and blended Simulation Learning opportunities for AED training in Arizona. 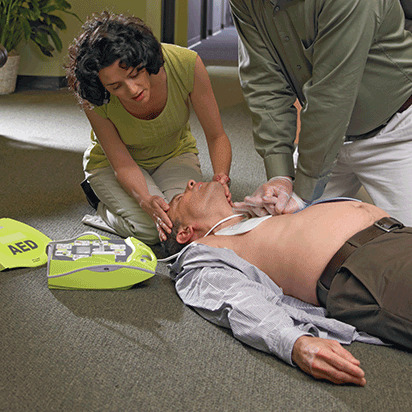 These courses can help you learn how and when to use an automated external defibrillator – and can help you save lives at home, at work, and everywhere in between. Although successful completion of any of our AED classes will result in a two-year certification, online-only courses do not allow you to demonstrate your skills to a certified instructor, and therefore may not meet the requirements for workplace safety certification. After successfully completing your Red Cross AED training in Arizona, your certification credentials will be valid for two years. During this time you'll have access to online refresher materials, and as your certification's expiration date nears, you'll have the option to take an abbreviated AED renewal class. This way, you can stay up to date on the latest information and techniques, and extend your certification by two more years. Even after taking Red Cross AED classes in Arizona, remembering your skills can be a challenge, particularly if you don't use them regularly. To help keep your skills sharp and your memory fresh, we've developed a quick step-by-step guide that you can print up and place in a binder, on your refrigerator, at your desk or in your bag, and refer to whenever, wherever you need to. If you have an Arizona AED certification that's within 30 days of its expiration date, you can register for an abbreviated in-person or blended Simulation Learning class. Both types of classes allow you to learn the updated science and best practices for when and how to use AED devices – and allow you to demonstrate your skills to a certified instructor. This means that upon successful completion of your training you'll receive full certification that's valid for two years. At the American Red Cross we not only offer AED training in Arizona, but we offer a wide range of health and safety classes throughout the state. In addition, we work as part of a global humanitarian network that responds to emergencies and provides training in more than 180 countries worldwide. In order to ensure that those we train are kept apprised of the latest information and techniques, our courses and materials are developed by experts in the field and reviewed by the Red Cross Scientific Advisory Council.